GSTR-1 is a monthly or quarterly return that should be filed by every registered dealer. It contains details of all outward supplies i.e. sales. In this article, we will explain to you how to file GSTR-1 from Tally 9 ERP 6. Step 1: Exporting the data of GSTR-1 from tally to excel file. Step 2: Converting the excel file to JSON file using GST offline tool available on GST portal. Step 3: Uploading the JSON file on GST portal. First, view the GSTR-1 report generated by Tally. For this go to Display > Statutory reports > GST > GSTR-1. You can view the GSTR-1 report in the table wise format with the details captured under different table heads similar to the actual form. 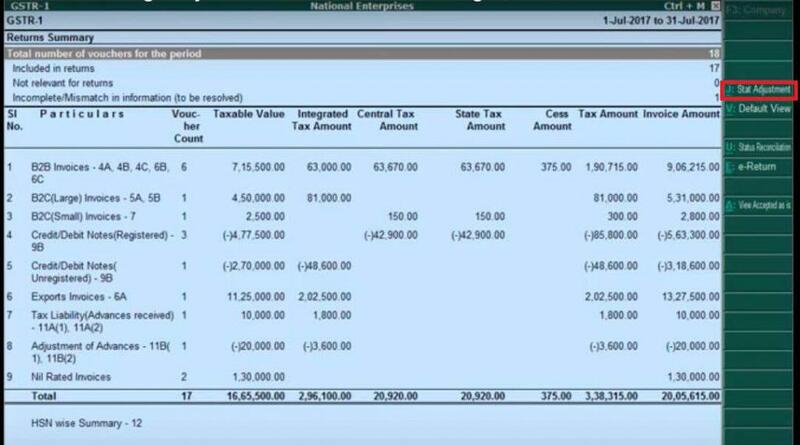 Alternatively, you can also select Default View which provides the tax computation information for all the sales or outward supplies. You can export the GSTR-1 details in excel file. But before exporting the GSTR-1, make sure that all the sales are included in GSTR-1 report. 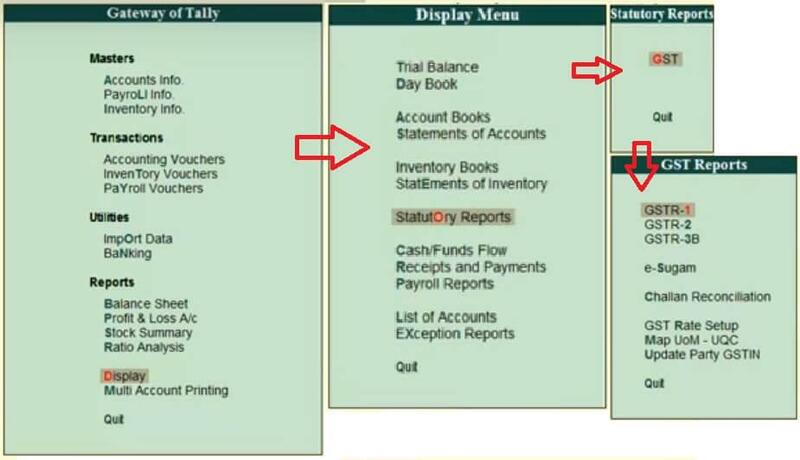 If any adjustments are required for instance advance receipts etc, press CTRL + J or click the Stat Adjustment button on the right side and pass the adjustment voucher entry so that it gets included in GSTR-1 report. To export the return, click the e-return button on the GSTR-1 report. Extract and install the GST return offline tool available on the GST portal. It will help you to create the JSON file from the excel generated from Tally. Once you have created the JSON file, you need to upload this file. For this login to the GST portal. Go to Services > Returns > Returns Dashboard. Now upload the JSON file prepared by you and submit the return. 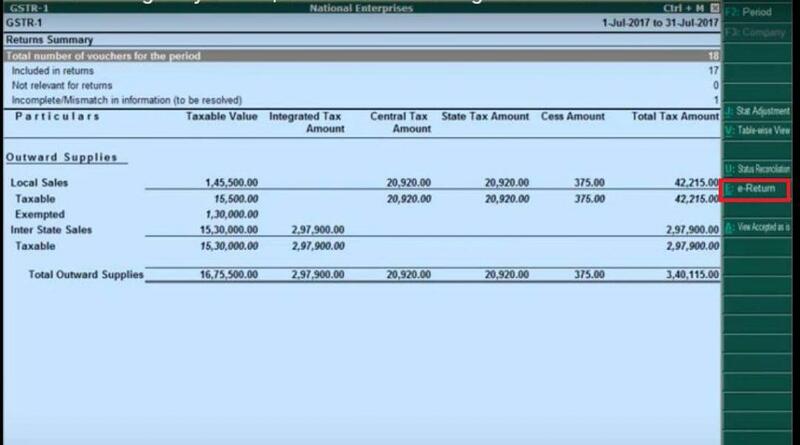 How does ClearTax GST Software simplify filing GSTR-1? Easy import of sales invoice to software. Auto-populate data to make sure that the return is error free. Update of return on GST Portal without the need to login. No need to convert Excel to JSON file. Just import data to ClearTax in a single click & upload returns onto GST Portal. Use ClearTax Billbook to create an invoice in a hassle free and easy manner. To understand how to create sales invoice in ClearTax GST software, refer to the guide on Creation of Invoices.